This is the month of Saint Valentine, and we send you our truly �heartfelt� thanks for your prayers on behalf of our mission and also for your financial support. You�re our Valentine! February begins an extremely busy season for KNOM, with elders� meetings and many other critically important events to bring to our listeners. It�s also a time when we gear up for the Iditarod Race, which is a time of extraordinary listenership and, for the KNOM staff, hundreds of extra hours of hard, stressful work. As we launch into this busy time during the coldest part of winter, we again thank you most sincerely. 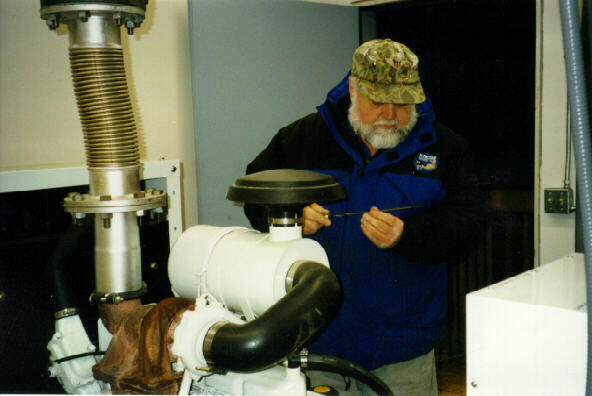 top SPUNKY LITTLE GENERATOR (left): Les Brown checks the dipstick of the remote transmitter site�s emergency generator. January 8th, brutal north winds blasted across most of western Alaska, gusting above 80 MPH in a nearby village, and close to 100 MPH at our site, funnelling down the Nome River valley. Sensing the power line�s instability, an automatic control turned on the generator, and a moment later when power totally failed, the generator came on line so quickly that the trans-mitter never went off the air. In the vicious wind, line crews repaired one break, but as darkness closed in, they returned to the safety of town. Without complaint, this hardy little generator, installed in spring 1998 thanks to your gifts, kept our signal on the air at full power for 26 continuous hours. Thank you! INSPIRATIONAL SPOT: The trouble with trouble is that it often starts with fun. VILLAGE NEWS: Isolated Gambell, 200 miles west of Nome on the tip of St. Lawrence Island facing Russia, lost telephone service for a week after a cable broke. For five days, vicious winds prevented a repair crew from flying in, and messages over KNOM became even more important than usual for these remote people. Phone technicians fixed the problem in wind chills of 60 degrees below! Meanwhile, 80 miles northwest of Nome, the tiny village of Brevig Mission lost its one small store to a fire fanned by 50 MPH winds. Fortunately, no one was injured. However, for groceries, Brevig�s 274 residents will have to snowmobile 14 miles round-trip to the village of Teller. INSPIRATIONAL SPOT: Whatever happened to the innocence of our youth? When did black and white turn into all of those shades of gray? At what point did lying and deception become little white lies and protecting our privacy? There aren�t so many shades of gray. And that little voice inside us tries to tell us that. Sometimes we don�t want to listen, to we attempt to suppress it. But it�s there. It will always be there, just as certainly as there will always be goodness, truth, beauty, God. May He bless our innocence. ALL SMILES: Music director Kelly Brabec (left) has re-upped for a second volunteer year, as has fellow volunteer Michael Warren. Thank God for their generous service! 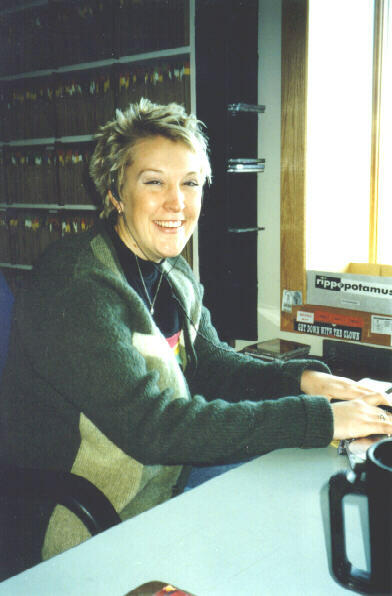 If you look closely, yes, those are 45 RPM records behind KNOM volunteer music director Kelly Brabec. 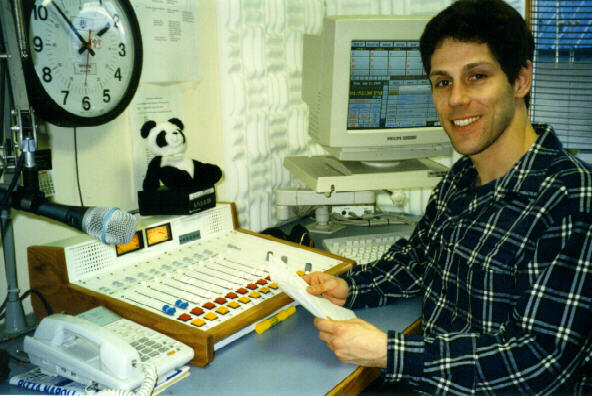 The cabinet holds about 5,000 of the old discs, which do find their way on the air once in a while. Also in the collection, you�ll find about 6,500 LP albums, collected between 1970 and 1988, most sent to us free by the record companies. We�re told that because they were so heavily used and the album covers are worn and scratched, the records aren�t worth much. However, they do brighten the KNOM air signal here and there with songs that aren�t available on today�s compact discs. INSPIRATIONAL SPOT: For God so loved the world that He gave His one and only Son that whoever believes in Him will not die, but live. Express the love of Jesus from your heart. These are your instructions before leaving Earth. top SURF�S UP! It�s easy to find KNOM on the Internet, at www.knom.org. You�ll find the past two years� Nome Statics, lots of photographs, a bibliography and a list of our many awards. If you�re not a �surfer,� perhaps a neice or nephew or a grandchild can show you the way. Many libraries offer free access to the Internet, and their staffs are usually happy to help you. SHINY (left): If the audio mixing console in Paul Korchin�s newsroom looks extra-shiny, it is! The small but sturdy console was a special gift from a donor. The old console operates just fine, and it will find plenty of work in the upstairs dubbing station, which Les Brown and Tom Busch plan to complete in February. INSPIRATIONAL SPOT: Teachers and scientists use beaded models to help us understand atomic theory and our cells� DNA, the building blocks of our natural world. The Blessed Virgin Mary gave us her Rosary beads to help us understand our faith, and Our Lord�s world. top IF YOU CONTRIBUTED $250 OR MORE DURING 1998, KNOM mailed you a receipt by First Class Mail on January 19th. If you did not receive it, or if the amount appears incorrect, please contact us right away. If you gave a smaller amount but would like a receipt, just ask. We�d be happy to send you one. 092-0019215 : That�s KNOM�s IRS tax number, for anyone who might need it. All contributions to KNOM are tax deductible to the fullest extent allowed by law. Thank you for your generous help. BY THE NUMBERS: KNOM�s immense success with listeners is the result of careful programming. Have you heard of another religious or educational station anywhere which attracts over 90% of the people within range, for an average of 3-1/2 hours a day? We do broadcast many long-form spiritual and informational programs, but an average broadcast day includes: 14% religious; 12% news, 8% weather, 8% education, 6% public affairs and 5% regional information, all held together by a 42% �glue� of music and companionship. In one year, the average listener hears over 5,000 inspirational spots! INSPIRATIONAL SPOT: Someone is lost. Wandering. Drifting far from God. Looking for hope. Looking for a way out. Searching for love. God is counting on you to share His saving grace with the lost souls of this world. Will you help them find God�s amazing, peaceful grace?. top CRACKING UP (left): When the lighthearted KNOM volunteers asked Florence Busch to take a goofy picture of the group in the front office, they were laughing so hard that it took about five minutes before they could even keep within range of the camera. A few minutes later, they held steady long enough for Tom Busch to snap a photo for you. From left to right (below, front): Connie Fessel, who assists in the business office, Vicki Muzik, who heads educational spot production and deejays the morning show, and news reporter Jodi Engle, who specializes in village news, afternoon newscasts and long-range news projects. (Rear) Michael Warren, who conducts most of our daily public affairs interviews, Kelly Brabec, who organizes and supervises KNOM�s on-air music, and Kevin Glynn, who has tackled the daunting task of organizing and transcribing KNOM�s hundreds of hours of Eskimo stories. Next month, you�ll find Kevin unrecognizable. A day after this picture was taken, he underwent a haircut and shaved the beard. INSPIRATIONAL SPOT: Home is an invention which no one has yet improved. 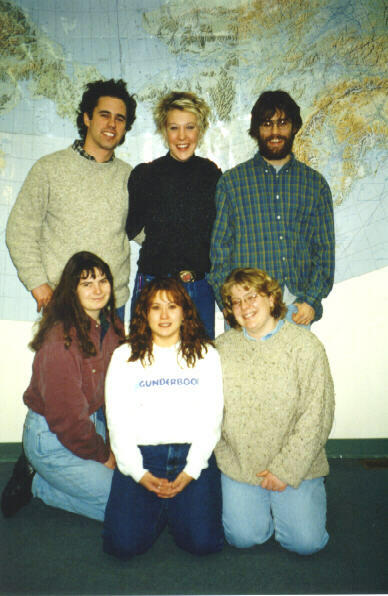 top 24 hours a day, KNOM�s signal of inspiration, education and companionship beam�s God�s Love throughout 100,000 square miles of wilderness Alaska, bringing faith and hope into dozens of isolated villages that, like Nome, are 500 miles from the nearest highway.